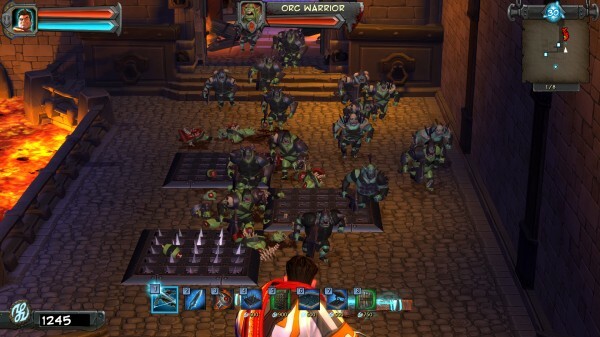 Orcs Must Die takes place in a fantasy realm, where the War Mage must prevent a mob of Orcs and other villainous creatures from entering the magical rifts connecting the peaceful villages in the world of the order to the Orc homeworld. Players must take up the sword and bow of the war mage and provide the last line of defense against the mob, which has one singular goal: to enter the rift. Players won’t need to rely on their own combat skill, as they can place traps in order to slow and hopefully stop the progress of the mob. At its very core, the game plays like a third person tower defense game, however the team at Robot added a touch of character that makes it truly stand out. The game consists of twenty different levels, each with an entry and exit point and various pathways connecting them. 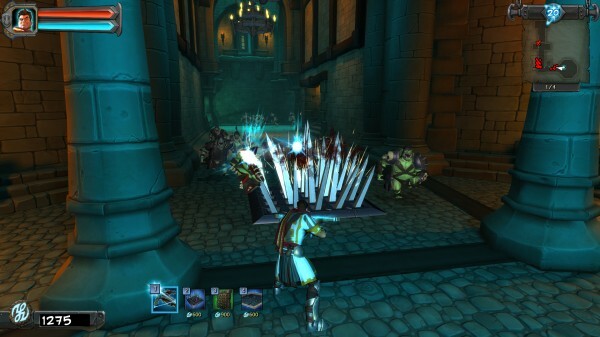 Players must find the best way to combine their own arrow, sword and magic attacks with trap placement in order to kill all the orcs. Prior to starting each level, players can explore and place a few traps. Each trap costs a specific amount of money, so players are forced to choose their traps and placement wisely. Most levels have choke points, where the enemy will be forced to bottleneck creating an effective kill zone. The three levels we played only had one rift and one entry point, however, we were told that some of the later levels may require more strategy due to additional rifts and entry points. Players are also encouraged to be aware of their surroundings. Many levels offer interactive environments that can be utilized for efficient destruction of the enemy. For example chandeliers can be shot down falling onto the heads of unsuspecting enemies and spiked logs can be released that clear entire stairwells. Later on, some traps can take advantage of lava pits, such as the jump trap which launched enemies into the air. Each kill results in gold for the player. This gold is the currency used in game to add new traps. Players are encouraged to kill creatively, as combos result in more gold, which means more traps. Trap effectiveness is greatly increased when traps are used in conjunction with one another. For example, tar traps can slow enemies down allowing the swing mace from the ceiling to make more passes on the mob below. Each trap has a red kill zone that shows its range. By creating areas where the red over laps by using wall, floor and ceiling traps, players can rest easier as their machines do the dirty work on the enemy. Some traps will need to reset before they can be used again, while others like tar traps are persistent. Multiple enemy types exist, including Orcs (obviously), quick running raptor like creatures, Trolls and Orc Archers. Each creature created a unique problem. Orcs come en masse, the quick enemies ran past slower traps, Trolls are immune to physics traps, such as the jump trap, and have massive health counts, and Orc Archers focus on the player instead of the rift. These were the only types shown to us during our visit, but Robot promised they had more up their sleeves. The enemies are sent in waves for each level, allowing players to rest and rearrange their tools for mechanized death each round. Players may realize during a round that their defenses are weak in a certain area or that certain traps are not effective in their current location. Thankfully, players are not screwed, as they can refund their traps for full value in between rounds. After all the rounds are complete and the level is over, players will be awarded a new toy that they can take with them into future campaigns against the enemy. 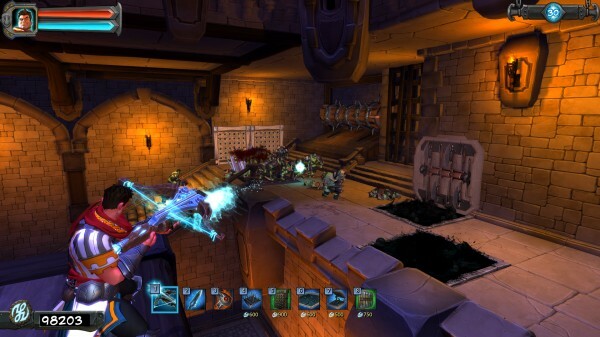 These traps can be taken into future and past levels, but players will be limited toward the number of traps they can take in at one time. After all the presentations from Robot, we had a chance to sit down and get hands on PC build of the game. Even though we spend the majority of our time with a controller in the hands instead of a mouse, we found the game easy to pick up and play. The combat controls were tight and allowed players to maneuver in and out of combat as they saw fit. 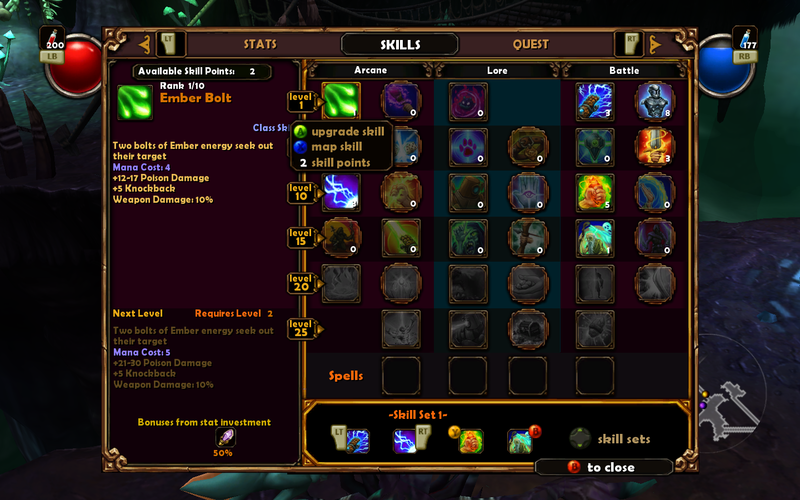 Players have both a health and mana bar. Mana will deplete slightly for each arrow shot and dramatically for each spell cast. The bar quickly refills though allowing a player focused on ranged attacks to stay a part of the battle. The real focus is one the traps. After setting our initial defenses, we quickly realized the need to place more in the middle of the rounds. It was surprising how simple trap placement was mid combat. Any trap can be rotated easily with the R key and then placed on a surface. Players can place traps from anywhere they have a clear line of sight, rather than having to be adjacent to the desired surface. We played a level near the midpoint of the game and had plenty of unique tools at our disposal to dispatch the enemy. Eventually we settled on a specific hallway and created a full gauntlet of obstacles for the enemies to run. Tar and spike traps littered the floor as Archers shot enemies from a nearby perch. On the walls, arrow traps and slicers tore into enemies. To some this might sound a tad gruesome, but Robot has infused a cartoony nature into the whole event of dispatching enemies. 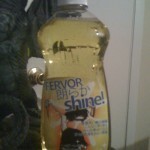 The entire activity is humorous and not gory. For example, when a Troll dies from a slicer it looks more like Christmas hams are flying from the machine than severed limbs. The team focused on character rather than relying on cheap gore. After our time with the game was up, it was extremely hard to put down. Robot has built an amazing potential franchise, which we pray finds its way to Xbox Live Arcade. At this time, the game is expected to launch on consoles, but decisions have not been officially made as to what platforms. We were unable to use a controller during our visit, but Robot assured us they would make sure the magic wasn’t lost moving from a mouse and keyboard to a controller. Considering the team behind the game made Halo Wars, we felt at ease. We can’t wait to see how the final product turns out. 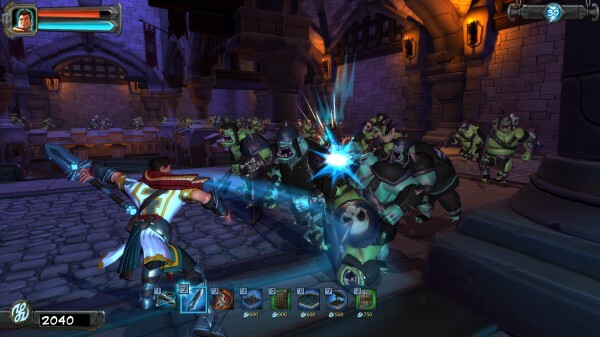 Orcs Must Die is a game that needs to be on your radar.